What kind of Walnut Creek electrician do you want to hire? A fast and dirty handyman who doesn’t answer calls, doesn’t arrive on time, and doesn’t seem to have any idea what he’s doing? How about a clean shaven, Diamond Certified professional with over ten years of experience? As one of the Bay Area’s leading electrical, heating, and cooling service providers, you’ll have a hard time finding a more capable, more professional, or more dependable electrician than Gentec Services, Inc. We cover all electrical services, from small repairs to massive municipal design and installation projects, which means there’s never any reason to call anyone else. Call a Gentec electrician today and we hope you’ll agree. Why Hire Our Walnut Creek Electricians? Our electricians are 100% professionally trained, certified, licensed, insured, and bonded. Electricity isn’t something that you should ever take lightly. Electrical wiring is the second leading cause of home fires, behind cooking accidents, and is the number one cause of fire related home damage. Our Walnut Creek electricians want to make sure that your family is safe so, we’ve put together a home safety checklist. 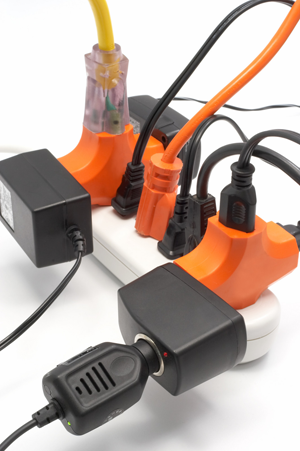 Check all cords to make sure they are not frayed or cracked and are placed out of high-traffic areas. Cords should never be nailed or stapled to the walls or baseboards because the coating can be damaged through constant rubbing. Also, do not place cords under carpets or rugs or rest any furniture on them. Always check the wattage of all bulbs in light fixtures to make sure they are the correct wattage for the size of the fixture. Replace bulbs that have higher wattage than recommended. If you don’t know the correct wattage, refer to the packaging. New compact fluorescents often show a standard wattage comparison. Circuit breakers/fuses should be the correct size current rating for their circuit. If you do not know the correct size, have an electrician identify and label the size to be used. Always replace a fuse with the same size fuse. Using an incorrect fuse size can cause the electrical grid to short and cause a fire. Make sure you use surge protectors on electronic devices to prevent damage from lightning strikes or other major electrical surges. Use ground fault circuit interrupters (GFCIs) in any area that may be prone to flooding. They can help prevent electrocution by shutting down electrical flow to any appliance that is in direct contact with water. It interrupts power fast enough to help prevent serious injury from electrical shock. Our Walnut Creek electricians suggest you test your GFCIs regularly, according to the manufacturer’s instructions to make sure they are working properly. If you’re not sure that your wiring situation is safe for your home and for your family, consider calling one of our electricians to give you a second opinion. We’re in the business of building long term relationships with Walnut Creek homeowners, so you can rest easy knowing that we’ll never cut corners or recommend unnecessary services. Our electricians have been around long enough to know which electrical infrastructures are safe and reliable for years to come and which ones have the potential to cause problems in the short term. We want you to feel confident that you’ll always get the right service from us, so give us a call today and rest easy tonight.